We believe that success in enhancing patients’ digital journey depends on understanding their preferences. That’s why it’s crucial to base your digital strategy on reliable statistics and measurable data. You Don’t Have to Sign a BAA With Your Web Analytics Vendor to be HIPAA-compliant. But now it’s time to go one step further and introduce the second-most valuable marketing technology that, when used wisely, is a very powerful asset in your digital marketing arsenal. We’re talking about content personalization in healthcare. Although web analytics is a handy tool that delivers valuable insights about the way patients interact with your platform, personalization is what gives you the power make your data actionable. Hold your horses – what are you talking about? We’re aware that this technology is quite new and requires further introduction. So let us explain what it’s all about. With this tool at your ﬁngertips you can tailor the experience of speciﬁed user groups, providing them with easy access to information and services that are relevant to their needs. They’ll give you a thorough overview of the issue. Now, let’s go back to our main subject. Why should I use content personalization? The answer to this question is simple – because personalized content and oﬀers are really effective. A recent study found that customized promotional e-mails produce six times more revenue than those that weren’t personalized. Moreover, another study showed that personalized promotional content gets three times more clicks than standard oﬀers. Adding even more weight to the argument, results of a survey by Janrain & Harris Interactive showed that nearly 75 percent of internet users get annoyed when content displayed on the websites they’re visiting is not relevant to them. The same goes for healthcare. When a patient visits the doctor for the ﬁrst time they expect an initial background interview. But when they come back for another visit, they don’t want to repeat everything they said during the ﬁrst appointment. Otherwise, they’ll feel their doctor isn’t paying enough attention to them. digitally connected to manage health care. This means that personalization in healthcare is no longer a nice-to-have feature. It has became a strategic imperative for every business operating in this sector. All that said, keep in mind that the line between making your patients comfortable and being intrusive is quite thin. This is especially true in healthcare marketing where privacy is a paramount concern. On one hand, people want to ﬁnd information that’s relevant to them and their speciﬁc healthcare needs. 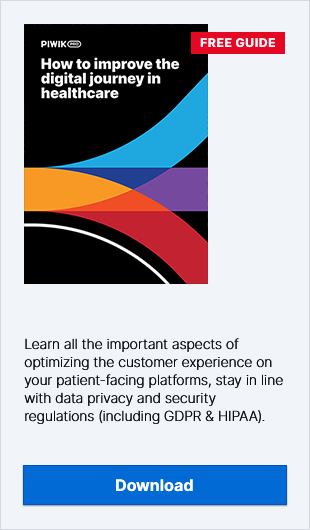 But on the other hand, this can’t be at the cost of patients feeling uneasy about the amount of information strangers (in this case – marketers!) have about their health conditions. A survey conducted in 2015 showed that consumers are concerned about the way companies use their data. Nearly 96 percent of respondents claimed that the idea that businesses and organizations know the information required to serve them personalized ads makes them feel uncomfortable. case management or care coordination, when providers contact individuals with information about treatment alternatives, and related functions. As you can see, although the list is not extensive, it still leaves a lot of room for promotional activities compliant with regulations and which don’t require consent from your patients. Important note! Using marketing tools in a privacy-demanding sector like healthcare requires the application of additional security measures. For more information about the sectoral data-privacy requirements you should meet, we advise you to visit this page. We know that talking about purely theoretical concepts is not particularly helpful. That’s why we now want to show you a practical use case of content personalization in healthcare. We’ll do it using the example of a patient-facing platform available only for logged-in users. Why focus our attention there? First, because it’s more challenging. These kinds of platforms are ﬁlled with sensitive data and should be handled with due diligence. Second, because patient-facing modules are the place where your clients spend the most time and perform the most activities on the platform. That’s why it’s so important to design them to ﬁt your patients’ needs and expectations. So, let’s proceed to the use case of utilizing personalization without putting your patient data at risk. For your convenience, we’ll explain it with an example from the Piwik PRO Analytics Suite. Let’s say you want to improve online medical care for patients aﬄicted with chronic illnesses, like diabetes, hepatitis or arthritis. You want the patient-facing platform to display relevant health recommendations regarding particular illnesses, including recommended dietary plans, exercises, supplements and more. That way, you’ll help your patients improve the quality of their lives despite their illness, while boosting their level of satisfaction with your services. You import the chronic illness data of your patients into Piwik PRO Data Management to create enriched client proﬁles. You then build audiences to count and segment suﬀerers of chronic conditions (e.g. audience #1: users with arthritis, audience #2: users with diabetes, audience #3: users with hepatitis, audience #4:…). Then you use the audiences in a personalization campaign. You promote content on customized banners and other placements that is relevant to patients with certain health conditions (e.g. personalized care instructions and dietary recommendations for patients who suﬀer from diabetes, or stretches to improve pain management for patients suﬀering from arthritis). The result: Your patients are more informed about the nature of their conditions, and they take steps to improve the results of their treatment by changing their lifestyle choices. The cost of treating patients decreases while their quality of life increases. They actively prevent complications from their diseases and improve their chronic disease management strategies. As you can see, personalization can be a very valuable tool for marketers trying to meet the expectations of today’s patients. However, we’re aware that all the information presented above is just the tip of the iceberg. That’s why we’ve decided to put together an exhaustive guide on leveraging personalization to improve the customer experience in healthcare. three more use cases for content personalization in healthcare. If you have any questions about our guide, products, or anything else, feel free to contact us anytime. Our experts will be happy to help you out!